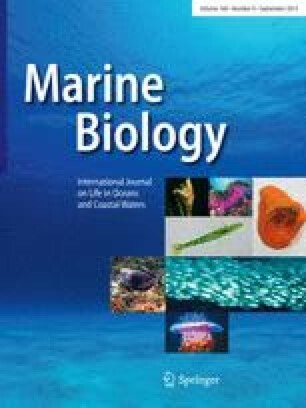 In this paper a series of growth forms of the sponge Haliclona oculata, the hydrozoan Millepora alcicornis and the scleractinian coral Pocillopora damicornis are morphologically analysed. The growth forms of these species were collected along a gradient of the amount of water movement. In this analysis it is demonstrated that, although these species are from very different taxonomical groups, the degree of compactness of the growth forms shows a similar trend as a response to the exposure to water movement. In all three species the growth forms gradually change from thin-branching to more compact shapes, as evaluated by measurements of various morphological characteristics. Other morphological measurements, in particular the average distance between branch tips and neighbouring branches (“branch spacing”) show a more species-specific pattern. Species in which fusion of branches is almost never observed, as for example P. damicornis, are characterized by a relatively low standard deviation of branch spacing. Species in which anastomosis frequently occurs (H. oculata and M. alcicornis) are characterized by a relatively high standard deviation in branch spacing. The final aim of this research approach is to use the morphological data acquired here in combination with morphological simulation models to gain a better understanding of the growth and form of these organisms and the impact of the physical environment (hydrodynamics and availability of light required for photosynthesis).